Airline companion fare. 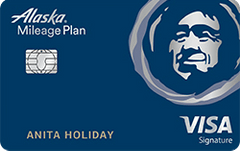 Enjoy Alaska's Famous Companion Fare from $121 ($99 fare plus taxes and fees from $22) and 40,000 sign-up miles after only a $2,000 spend within the first 90 days. Every anniversary, earn the Famous Companion Fare again. See more of the best airline credit cards of 2019. Our take: The Alaska Airlines Visa Signature credit card has a $75 annual fee and an average sign up-bonus, but the earning scheme and great benefits make it worthwhile – especially for West Coast fliers.